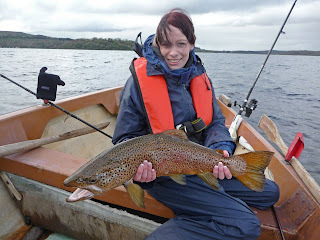 Marie Finnegan from Brosna Co. Kerry, caught this fine brown trout during the Easter Pike Festival on Lough Key. The fish weighed in just under 11lbs. and was subsequently released again. I am sure many of you will agree, this is truly a magnificent looking fish, and certainly the biggest trout caught here in a long time. 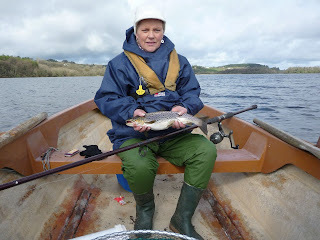 Also shown is Marian Leahy who also caught a trout of around 2.5lbs. Thanks to Patrick Leahy for sending us the photos. 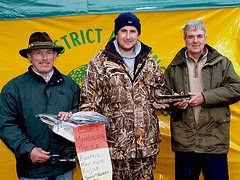 Now another very successful Easter Pike Angling Festival is over and what a good turnout it was! The weather was reasonably kind on both days and so were the people down at the Doon Shore, Lough Key. 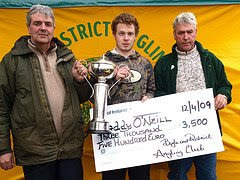 The winner of the Euro 3,500 and the Moonstone Jewellers Perpetual Cup was with a pike weighing 23lbs. 8 ozs., Paddy O'Neill from Mullingar. 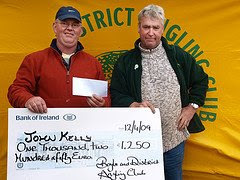 Barry Darby, also from Mullingar won the Club members prize for catching his pike weighing 16lbs. 6oz. 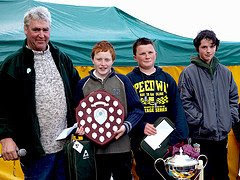 1st in the Juniors section came Willis Carlin with a pike weighing over 11lbs. 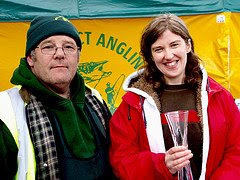 and local Lady Miriam McGee won the Ladies section of the competition for her pike of over 8lbs. 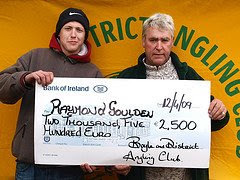 Well Done to all anglers and a Big Thank you for turning up so plentiful once again to take part in this event and to enjoy the Fishing and Craic, that can be had in Boyle. Also a Big Thank You goes to all our sponsors, helpers, members that helped so generously, to make it all happen! A good day was to be had here in Boyle yesterday, the biggest fish caught so far is over 21lbs.. The weather looks set to be fine here for today, asn as soon as the fog lifts we should have some clear weather for the second day of the Festival. Let's see what the day is going bring. Good Luck again to all competitors!